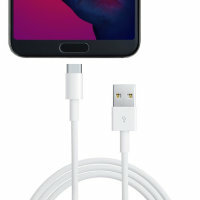 Perfect for charging and syncing across files, this official 1m Huawei P20 Pro Super Charge USB-C to USB-A cable provides blistering charge and transfer speeds. It also supports Huawei's Super Charging. It's an official Huawei cable, not the cheapest but it charges the phone fast when used with the Huawei charger. It works as a more general purpose USB-C cable too but fast charging the P20 Pro is the point. The 1m cable is compatible with and perfectly suitable for, the Huawei P20 Pro. Using the latest USB-C technology, this cable is able to provide your phone with blistering transfer and charging speeds.